Spring has finially arrived ... Kayaks and canoe free to use on premises. Outside fire place ,free firewood. Welcome to central Maine. / with special off season rates as low as $300 per week from December to about May 11 th. each year. 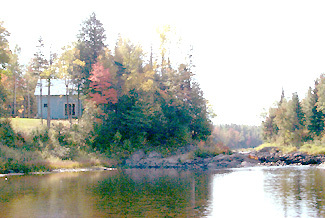 This is a single cabin on a wide stream, sitting on a peninsula with great views up and down the river. It has about 2000 feet of water frontage with a 1/2 mile private entrance. ( Kayak useage included.) The peace and quiet in a beautiful river valley, at an outstanding value, is what makes this location stand out. In this photo the water shown is just a bit higher than normal , The waters edge is about 100 feet from the cabin. From my house, I can hear this whitewater and its over a half mile away ! You wont need one of those cassette tapes of nature sounds to put you asleep nights. 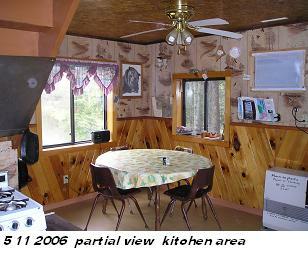 The Cabin is accessable by car , ATV and snowmobile and is within a half hour drive of the following towns. 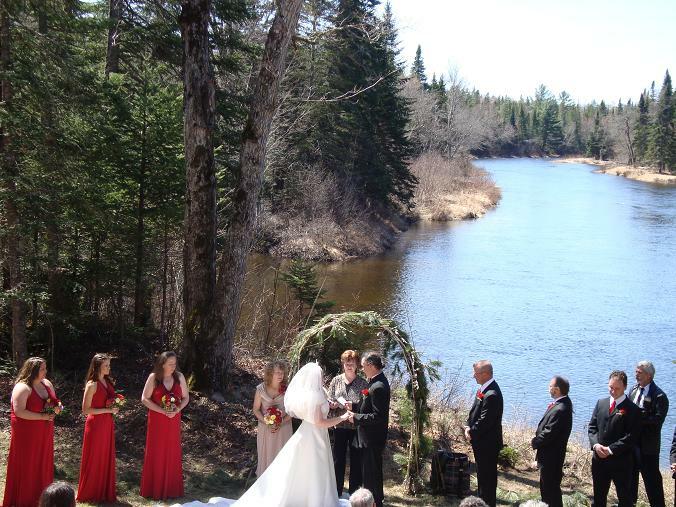 Abbot, Guilford, Sangerville, Monson, Shirley, Blanchard, Dexter, Ripley, Mayfield, Dover Foxcroft, Cambridge, Parkman, Kingsbury, Willimatic, Piper Pond, Whetstone Pond, Sebec Lake, Bennet Pond, Davis Pond, Early Landing, Milo, Charleston, Atkinson, Greenville and Greenville Junction I accept short term reservations if the cabin is available. just look at my online calendar and email or call to confirm. I only need a 2 - 4 hour notice to have it ready for you. 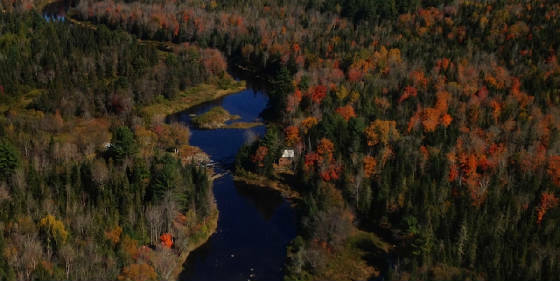 Recreational opportunities are abundant in this area with its lakes and ponds , streams and forests, whether you're hiking ,white water rafting, mountain climbing, This area of Maine is generally within an hours drive of countless hours of activities , our coast and lighthouses are a bit further. A guide book is furnished ( Delorme's) with an endless list of places and things to do, such as Unique natural areas, Scenic waterfalls, Beaches, National and State Parks, Recreation areas, Lighthouses, Hiking trails, Places of interest and much more. Other options are those morning walks in a very safe neighborhood, canoeing and kayaking, or evenings building a fire outside in the fireplace , (free wood) and cooking popcorn over an open fire with a real popcorn cooker - you add the kernals, slab of butter and gentlely shake above the flame. Winter activities may involve snowshoeing (2 pr. provided) ice fishing nearby ponds and lakes, cross country skiing, or even renting snow sleds , a day or partial day, from nearby Greenville area. The "camp" is 6 tenths of a mile down behind my house with a private access ( no other people, vehicles ) There is a residence on the other side of the stream and the visibility of their home is blocked by trees and foilage. Their access is not thought the cabin access . 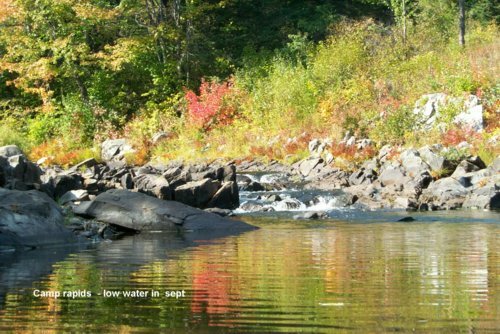 While your here you will realize that you have about 2000 feet of water frontage to yourself and that this stream is about 200 feet wide in many places. Ok, heres the brief on this place. 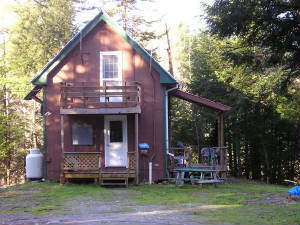 Cabin in Central Maine: 1 1/2 story camp on beautiful Kingsbury Stream in Abbot Village. (A four season retreat at a low price ) Peace and quiet is yours in this single furnished cabin , located in a senic valley surrounding. It may be considered a camp , cottage or cabin, but its not a condo, timeshare or lodge, thereefore we can offer low rates .Weekly Rates start at 300. to 550 / week, depending on the season. Sleeps 2-5 persons. (My lowest rates are in the snowmobile and spring seasons. ) There are 2 bedrooms - 4 beds, outside ground deck, & upstairs bedroom balcony (outside ) , drilled well , hot water, shower, oil furnace as well as an outside fireplace and gas grill. 1/2 mile private drive, 2000 feet of water frtontage, no through traffic ! Great base to enjoy the beauty and tranquility of the area by the outside fireplace evenings or from the deck, just outside the sliding glass door. or have your morning coffee from the upstairs balcony ., Of course other options are relaxing beside the water , exploring local waterfalls , hiking , reading a book or hunting and fishing. ( see my THINGS TO DO page)..Come live 75 feet from the gentle roar of the white water and scenic waterway. You may see deer crossing the 200 ft wide stream from the deck or large window looking up stream. Local wildlife include deer ,turkeys, beaver, bunnies, bald eagles, squirrels and an occasional moose. 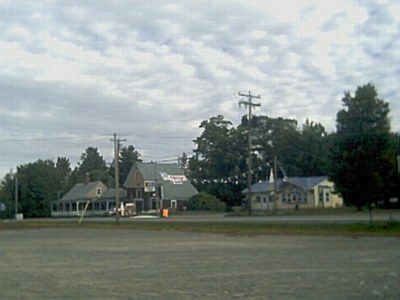 This region of Maine ( Abbot Village ) is away from the hustle and bustle and commercialism of other parts of the State. This is truly ' LIFE AS IT OUGHT TO BE ". 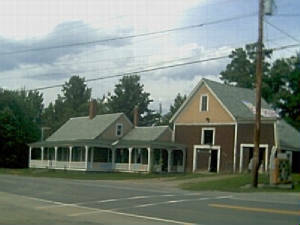 Abbot Village is a small friendly town ( with one convenience store and one bakery, 2 crafts shops and ice cream place) that sits near the exact center of Maine at the junction of 2 rivers that drain from the surrounding lakes, ponds, hills and mountains. 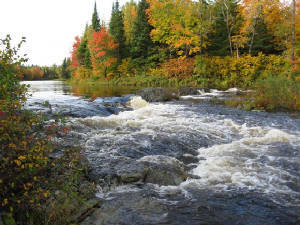 It is between Bingham , Greenville and Bangor, we are on the southern edge of the Great Northwoods, It is a diverse area with some unique geological features to include Slate quarries, several small waterfalls, and hundreds to thousands of miles lumbering, ATV and Snowmobiling trails . miles of working forest roads Just a few hundred feet from our roads, you will see some very scenic areas. I own about 100 acres here and this cabin is on the backside of my property My camp is complete with all except washer and dryer. . . Many photos, full description,, things to do page, and availability calendar on this web site, average email response time 1 - 3 hours, often minutes. AND YES ladies the cabin does have inside plumbing ! We are proud of our rates, I believe they are among the lowest in the State of Maine. PLEASE dont add half of this tax ( or any part of it ) in your 50 % deposit . it will be added on the amout due on your arrivial . Welcome to my personal web site! There are 10 pages here, WHITE LINKS ( index ) ABOVE AND TO YOUR RIGHT. .. We were fortunate enough to have a choice where to raise our family , we made the choice of country life as opposed to a town. We made the right decision , they have grown up as responsible adults. .. One of the things we did when we moved up to this farm was to start cutting each years firewood in a straight line right toward the river. Its 6 tenths of a mile back . (this is a 100 acre lot ) Gradually as we built a road down there ,we realized that this is a perfect place for a camp / cabin . So with family and friends that's what we did. ..In 2006 we started to rent it as a vacation spot , we installed electrical appliances, satilite dish ,drilled well , septic system for protential guests and now we rent it out 4 seasons as income.